Comprehensive Brand Identity Design for ADDLAB, Helsinki, Finland. Rebeca Méndez Studio conducted research during the months of June and July. The findings were delivered and discussed in person in multiple meetings and conversations with client at the end of July, 2011. Prior to our involvement, Aalto Digital Design Lab was referred to, in speech and writing, as the acronym ‘A. D. D.’ Our recommendation was to move the name away from ‘A. D. D.’, which points towards ‘Attention Deficit Disorder’ and to adopt the new positioning of ‘ADD’ as in ‘addition, additional’ focusing on the ‘Added Value’ design offers. As a tangible result, a new name: ADDLAB, selected ‘ADD’ words, and a positioning text which became the essence of the capabilities brochure copy. The logotype and logomark (curly parenthesis) designed to conform to Aalto University Graphic Identity Standards, which calls for Nimbus as their font. The logotype is composed of the capital letter ‘A’ and an analphabetic character. For ADDLAB we selected the curly parenthesis, taken from digital ‘code’ script. The curly parenthesis are open towards the space outside the space of the logotype, in a sense, ad- dressing everything, all that exists. The color palette was designed to accommodate offset printed materials (Pantone and CMYK), digital/web (hexadecimal) and broadcast (RGB) color palettes. The logotype and logomark (curly parenthesis) designed to conform to Aalto University Graphic Identity Standards. ADDLAB Logotype follows the Aalto University Brand Identity Standards. The logotype is composed of the capital letter ‘A’ and an analphabetic character. For ADDLAB, we selected the curly parenthesis, taken from digital ‘code’ script. The curly parenthesis are open towards the space outside the space of the logotype, in a sense, ad- dressing everything, all that exists. ADDLAB business card, back side. 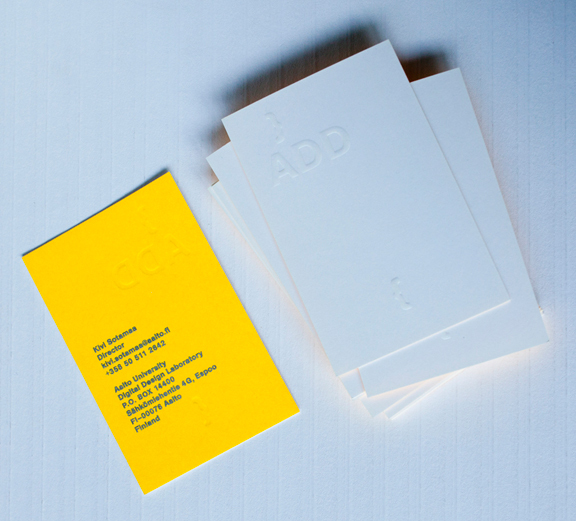 ADDLAB business cards. Front, logotype/mark blind emboss; back, fluorescent yellow and silver inks. Uncoated cotton rag stock.